The puppies in this litter are from AKC Registered parents and can also be registered with the AKC. 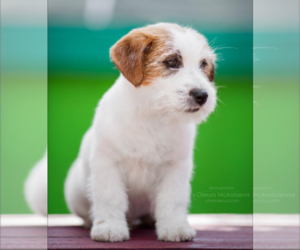 We are a very small hobby breeder, specializing in Not Your Ordinary Jack Russell Terrier. We raise only a few litters each year of 100% European (Jack) Russell Terrier puppies exclusively, and they are born in our home, socialized and pre-spoiled! Parents DNA screened for PLL & SCA; normal/negative, no carriers. Cleared by a licensed vet with health cert and microchip. Please visit our website for more information.